The number of drug finds in Welsh prisons has gone up by 475% in the past five years, according to new figures. Research by the Wales Governance Centre shows the numbers have risen from 114 cases in 2013, to 656 occasions when drugs were found in jails in 2018. The Ministry of Justice (MoJ) pledged to spend £30m on security to prevent "record amounts" of drugs in jails. The Prison Officers' Association (POA) said it reflected a staff shortage, rather than better detection. The growth in drug finds outstrips the 9% rise in the overall prison population - and double the 200% rise in drug finds in English prisons. 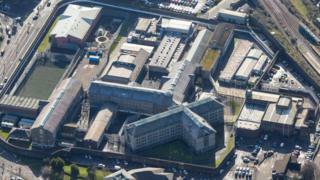 There have also been 46 drug finds at the UK's biggest jail HMP Berwyn in Wrexham, the £250m super-prison which opened in February 2017. Swansea prison (26) had the highest number of drug finds per 100 prisoners, followed by Parc in Bridgend (22) and Cardiff (21). A steady rise in positive results from mandatory drug tests over the last three years, with 10.6% of results positive for the year ending March 2018. Psychoactive substances were by far the biggest problem, showing up in 60% of all positive samples. The number of alcohol finds has remained consistent in the last two years, with 227 incidents, 84% of them at HMP Parc. "If you cut over 7,000 operational frontline posts, disband dedicated search teams, reduce the capability to detect and deter and insist that nothing is wrong then you should not be surprised when drugs, weapons, debt, bullying and misery ensues," said Mark Fairhurst, national chairman of the POA. "The finds indicate that our prisons are awash with illicit items and only robust action will resolve the epidemic that blights our service. "The POA want airport-style searching at the gate every time a person enters our jails. We want dedicated search teams reinstated, with dog sections in prisons to conduct hourly perimeter checks. Get technology in our prisons to block mobile phone and drone signals and ensure organised criminals inside our prisons are disrupted by robust staff action." Dr Robert Jones, from the Wales Governance Centre, said, "Drug and alcohol finds within the prison system have been a matter of public and media interest in recent weeks, and the latest data available for Wales suggests that a concerning and challenging set of circumstances has emerged within the prisons system. "It is likely that given its commitment to tackle substance misuse, the Welsh Government will be taking a keen interest in this data and the prison system in Wales, which is the responsibility of the UK Government." He joined governors and senior officers in giving evidence to the Commons Welsh Affairs committee inquiry on prison provision on Monday. Amy Rees, head of prisons and probation in Wales, told the committee that a number of pilots were looking at better detecting drugs being brought in. "There's a lot of anecdotal evidence that people are getting themselves recalled to custody to bring in drugs - we know there's an illicit economy that's extremely lucrative," she said. "We have got to make sure that we invest in the right things to try to resolve these issues. For example in Wales there's quite a strong prevalence to use psychoactive substances on paper, so we're looking very carefully at what we can do with mail, that can be different 100 miles somewhere else. "As we get on top of that they'll switch to another, so we have to try and respond to local intelligence and make decisions around that." The Prison Service said officer numbers are at their highest level for five years - with more officers being recruited - and there have been 41 convictions of prisons found with contraband in the last 18 months. "Better intelligence and improved security are allowing staff to prevent record amounts of contraband entering our prisons," said a spokesman. "But more must be done, so we've committed £30m to further boost prison security, as well as rolling out body scanners, sniffer dogs and phone-blocking technology. "Prison officer numbers are at their highest level since 2013 and the extra 3,000 officers we have recruited over the last 18 months are now working to ensure prisons are safe and that offenders can get their lives back on track."